General Booth Boulevard location will celebrate Grand Opening on April 2.
sweetFrog has been rated Best in the U.S. bu The Daily Meal. We want sweetFrog to be THE PLACE our friends in Virginia Beach choose to gather and enjoy a sweet treat. sweetFrog Enterprises, LLC.is pleased to announce the reopening of its General Booth Boulevard location in Virginia Beach, Virginia. The General Booth location is the 86th sweetFrog store operating in the Commonwealth of Virginia. 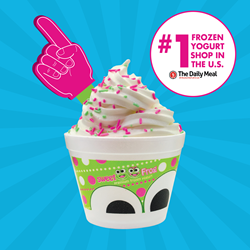 sweetFrog offers a wide selection of frozen yogurt flavors, along with fresh topping choices and a self-serve model The premium frozen yogurt chain was recently named Best in the US by The Daily Meal. The store, located at 2236 General Booth Boulevard, Virginia Beach, VA 23456, will begin opening festivities on March 23, to include free t-shirts to the first 25 guests every day until their Grand Opening on April 2. During this time, customers can also win a free sweetFrog party for 6 through a “Like and Share” Facebook contest. The grand opening celebration will feature prizes, balloons, stickers, lots of giveaways and appearances by the ever-popular sweetFrog mascots, Scoop and Cookie. The first 100 guests receive will free t-shirts and every purchase comes with a return-visit BOGO card. In addition, guests can get their frozen yogurt free if they can guess the weight of their cup and there will be a drawing for one lucky guest to win free FROYO for a year. "Our goal is to be a strong community partner in Virginia Beach; and whether it’s a birthday, a fundraiser, or a special night out, we want sweetFrog to be THE PLACE our friends in Virginia Beach choose to gather and enjoy a sweet treat," said Patrick Galleher, sweetFrog CEO. The celebration will not stop after the grand opening. From April 4-8, sweetFrog will celebrate Virginia Beach’s medical professionals, schools, fire and rescue, local businesses and churches with 50% off purchases on their designated day. In addition, there will be a 50% donation of sales to non-profit organizations who book benefit nights and 50% discounts on birthday party bookings by April 8, 2016.